The Oklahoma Bill of Sale Forms are considered legal documents that are designed to provide legal proof of sale and purchase. These documents will provide needed information regarding the parties, change of ownership and any identifying information pertaining to anything being sold and purchased. Some documents will require notarization. 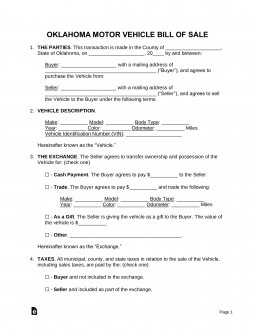 A completed Application for Oklahoma Certificate of Title for a Vehicle (Form 701-6). Lien documentation if your vehicle is financed. You must complete a Boat or Outboard Motor Serial Number Confirmation (Form BM-10) if your boat’s outboard engine is over 10 horsepower. You must submit a Manufacturer’s Statement of Origin (MSO) if the boat has been purchased new. Or submit the boat’s previous title if it’s been purchased from an individual.